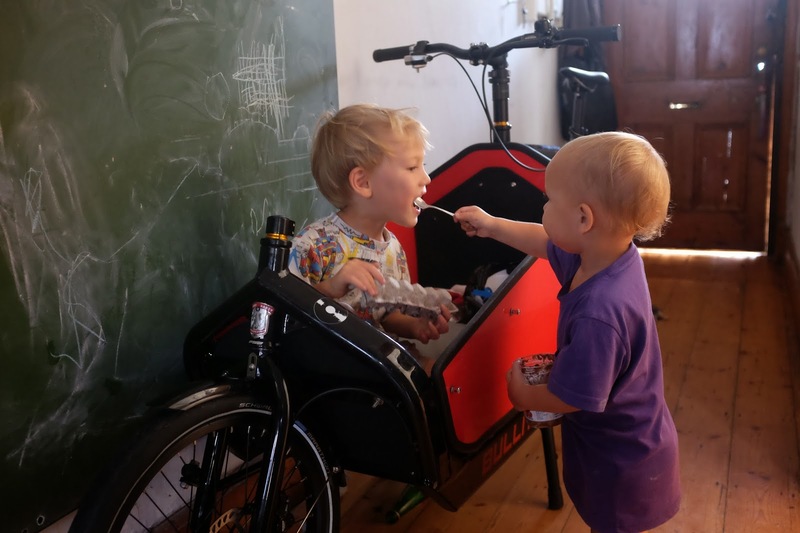 Life with Noah and Eli has been pretty amazing of late, not least because of the cargo bike. 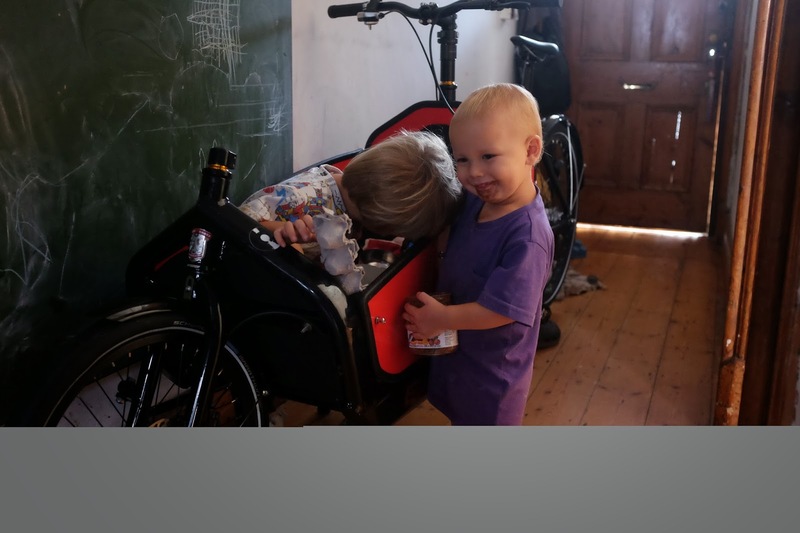 A lot of things happened at once: our friends from Australia returned home after a lovely visit, we decided to try limiting our kid's screen time to Sundays only (at the same time we'd been trying to take a day of rest more seriously), and the Bullitt arrived. What had been a pretty tough time parenting-wise suddenly turned around. When Noah is tired or on edge now, he gets into the crate of the Bullitt with an encyclopedia and looks at pictures of fossils. I don't know exactly why. 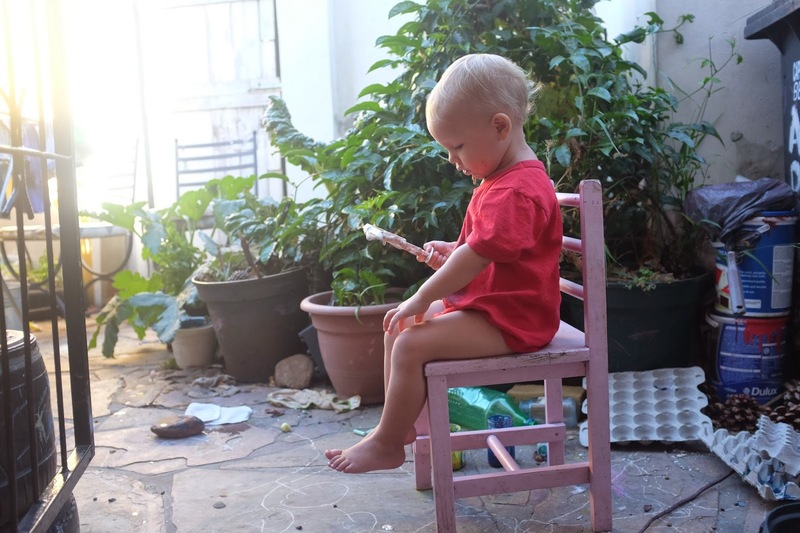 We've tried these kind of soothing solutions before, but up to now the only thing that worked to calm him down was media, which seemed to make things worse in the long term because it didn't teach him how to cope with difficult emotions. I'm not sure what we'd have done if the kids had kept asking about the iPod or computer, but to my surprise Noah seemed to welcome the boundary, and Eli, while he loves Kipper, doesn't think of it when there's no computer around to remind him. Eli feeds Noah the dregs of the Nutella jar. We have a tradition of buying Nutella every time we have houseguests, and when Tiff and Justin left, the kids cleaned the jar so well I barely needed to wash it. It's been really hot so we've been making ice-cream. Eli gets to lick the paddle outside. In other news, our granadilla vines are finally starting to grow granadillas! Today I took the kids on the train to Kalk bay. The train station is about 20 minutes walk away, but for the kids it's more like an hour-long walk. With the heat, that's just too long. 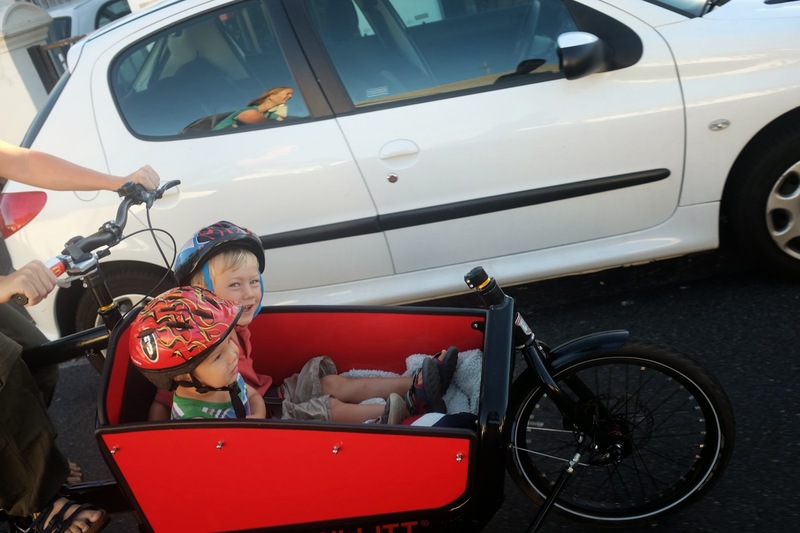 Up to now, we've mainly driven to the beach, but with the Bullitt it's a 5-10 minute ride each way to the train station, and when they're tired after a long train ride, we can just pop them in the crate and ride home. Eug somehow rode and took photos at the same time. On the train, the kids read books and looked out the window. We waited a long time for the train in each direction, but it was still apparent that the train time was much more enjoyable than car time for the kids. 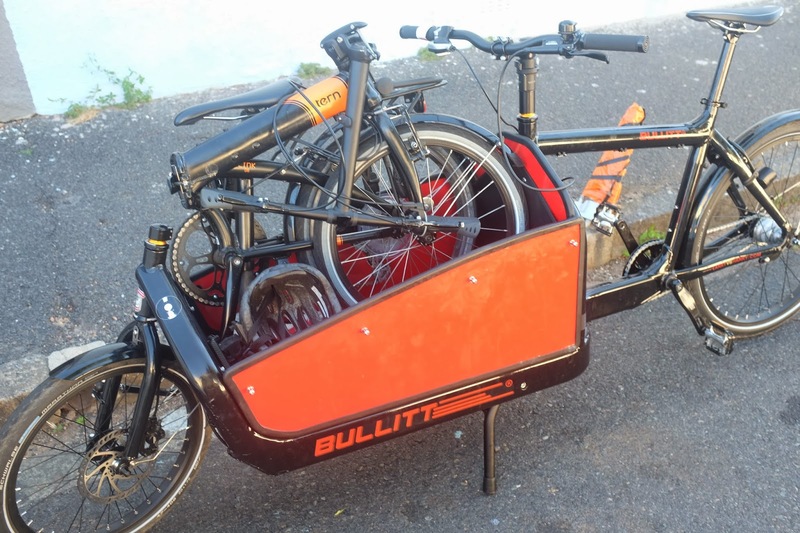 Relying on the Bullitt and public transportation makes some places difficult to get to but others easier. The Science Center is now an easy trip- instead of a grueling walk up the hill with the kids, it's a quick 5 minute bike ride. If only I liked going there. We are keen to explore the city centre - where it's hard to find parking but is an easy bike ride away. We went really early to try to get to the beach before it got too hot. Eug rode with us to the station and brought the Tern back in the Bullitt. After a week with the Bullitt, we're still in the honeymoon phase- we haven't managed to sell our car yet and it's still sortof funny when I have to drag myself up a hill and can't. To make it work in a mountainous city like Cape Town in the long term either we will need a BionX electric assist or I need to have a body transplant. Can you see the McDonald's ice-cream wrapper on the handlebar? Eug took the Bullitt through the drive-thru yesterday. 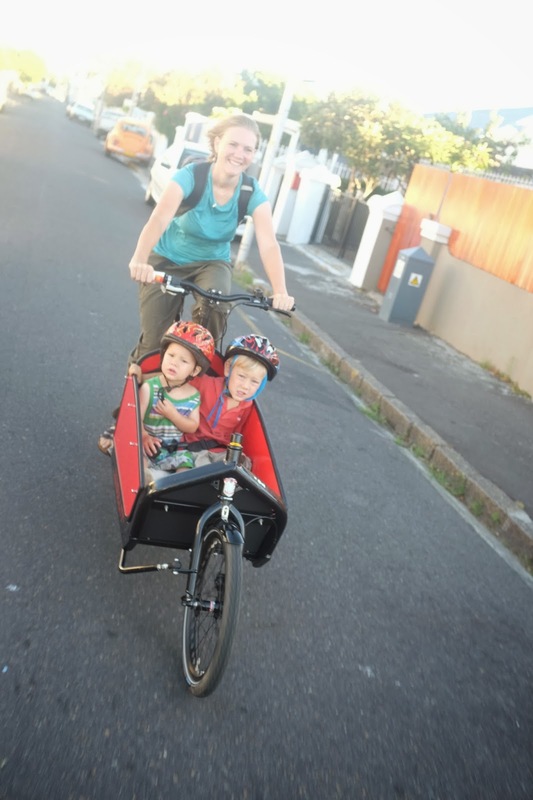 Going on busy urban roads for the first time has been nerve-wracking: rather than just thinking of my own safety, I have to consider what is an acceptable risk for Noah and Eli, and my gut reaction is "NONE!" But then I ride, I'm pretty cautious: I wait at intersections until there's really no doubt of it being safe to cross over, and gradually it's less scary. It feels like we're at the beginning of a new adventure. We have multiple conversations every day about commuter biking. We are able to understand first-hand how highways split up communities and make commuting by foot or bike a nightmare. The role of trucks in small urban roads seems more questionable. We can describe different routes to other commuters. We're more connected to people in our neighborhood. 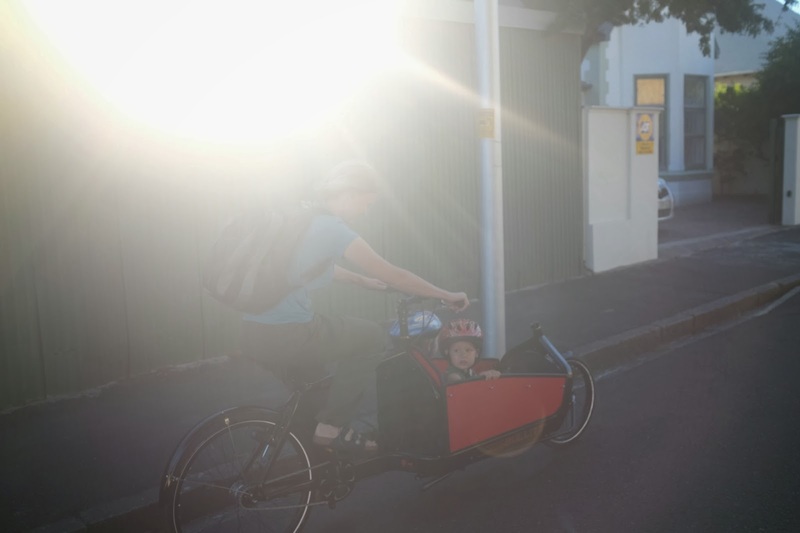 I'm imagining more broadly what is possible with pedal power. And that's just after a week.